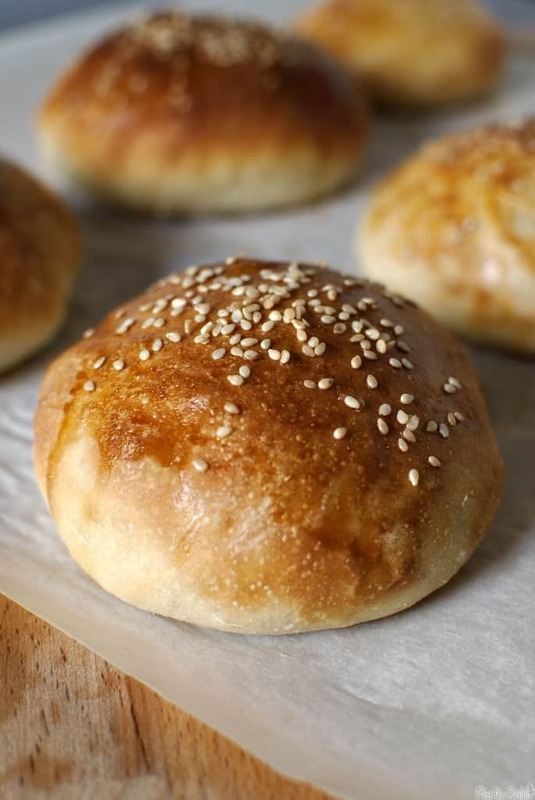 Homemade light brioche buns are light and tender on the inside and golden crispy on the outside. Sturdy enough for a burger, yet soft enough for an every day dinner roll. A key component to any great sandwich is the bun. You need a bun that can hold up the fillings, but doesn’t take away from the experience. (oh, insert the bun jokes here.) I’ve been known to throw away a bun if it’s too overpowering for the burger, or just takes away from the experience. Oh and if its too chewy or dry, its out. So, needless to say, with all the burgers off the grill lately, there have been some brioche buns baking in this household. We’re not even going near the oven jokes – that just freaks me out. My first batch of brioche buns looked wonderful, right up until they deflated (a second before being placed in the oven). They were good, but rather short for a burger. Danielle over at Runs with Spatulas mentioned these to me and I knew I had to try them after my other defeat. Here’s the recipe for the brioche buns. Let me know what you think! These brioche buns turn out beautifully, although, I may make a change next time. Because the brioche buns deflated the first time, I plan to bake them for 7 minutes before adding the egg wash, and then finish the baking. The suggestion is made by a friend of mine. And on a serious note: when baking using steam, be very careful when opening the oven door. Perfect buns!! They are so adorable. These are gorgeous! Nice job! We want to start a new tradition this year for July 4 with a GIANT hamburger. Obviously, I will have to make the bun. Will give this a try! Thanks! The worlds greatest burger buns. They are so good! She suggested these buns to me too. I need to make them soon! I really need to try making homemade buns. These look like a great place to start! Those buns really look like the perfect buns! You made some pretty awesome looking buns there! I like that they aren’t super fluffy, leads to goo burger to bun ratio. I love everything you post!! Your blog is amazing, these look great! Very nice! I’m on a mission to make as many different burgers as I can this summer and these buns would be great for that! Thanks. 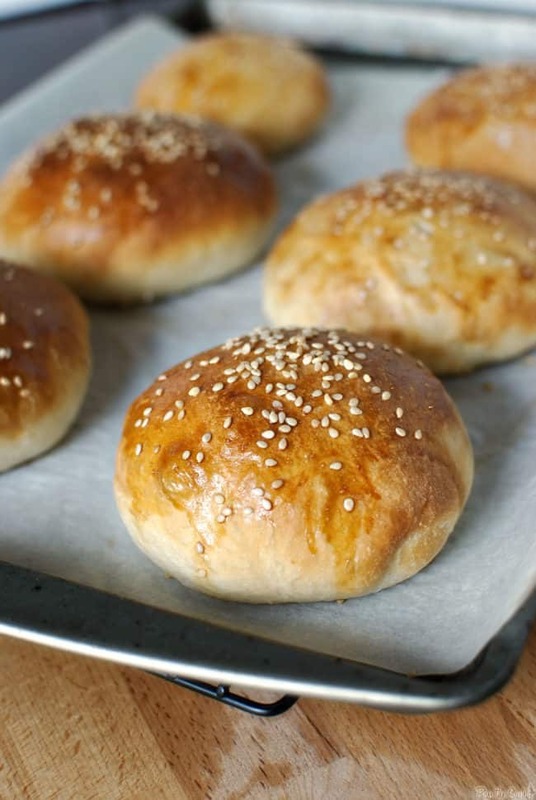 This is my go-to recipe for burger buns too. They’re just the right balance of light and fluffy, and they’re substantial enough not to fall apart when they’re stuffed. I find that they do deflate a little bit when you brush on the egg, but they’ve always puffed right back up in the oven… never had a batch go bad on me yet (and I make these A LOT). I saw this recipe on Running With Spatulas as well. I have it printed and ready to make. You did a great job with them! I think I’ll make these buns for our next cook out. Wonderful job on these. Nothing makes a burger or sandwich better than a fresh bun. those buns look so very very good! what a great alternative to those white bread rolls they sell at the store! I have always wanted to try and make a brioche bun, thanks so much for the inspiration! Your right about steam, some of my worst burns have come from steam! Wonderful and delicious buns Kita! I can almost smell the warm smell from your oven and ahh toasted sesame seeds..yummy addition! Awesome photos!!! Oh, wow, Kita! 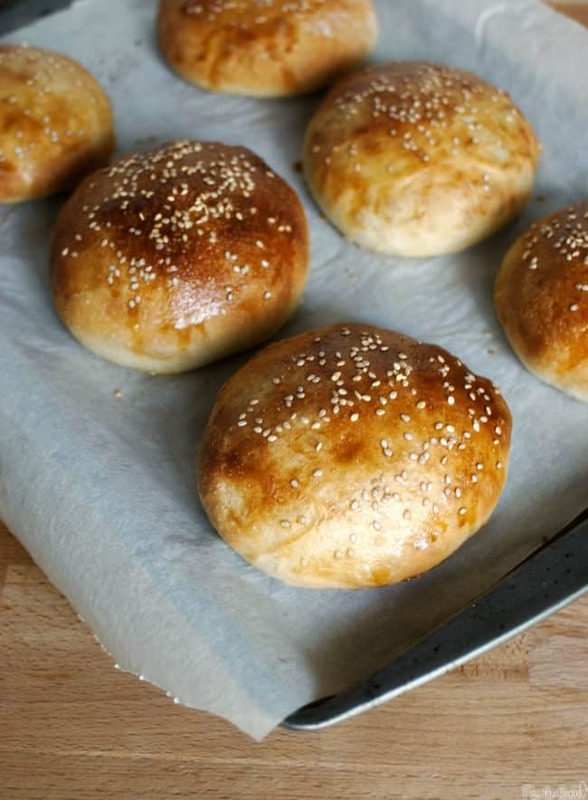 These look like the perfect burger buns. I’m picky about my bread, too…and I know I’d have no complaints with these! I’m in serious trouble now. I’m trying so hard to come up with vegan baked goodies, and here I’m drooling at your burger buns. Do you feel my pain? I have the feeling I’m gonna make these soon! Kita, these are absolutely gorgeous… I hope mine will turn out as beautifully as yours! I have to make these! OH Congrats on Top 9!!! Homemade bread just makes life better. I can only imagine the tastiness of these!!! Very nice, Kita. I’ve done a lot of playing to create buns like this, and that steam is sooo important to their finished rise. Way to go! Those look great! Thank you for sharing this, Kita! I have been looking for a good recipe for burger buns. I just made brioche knots a few days ago, and I am kicking myself for not thinking of turning them into buns! 🙂 Thanks for the inspiration! Yay! I’m so glad these turned out for you! Now this makes me want to go make them all over again! Very nice! I bet my husband love to make those great looking brioche buns for me. Thank you fro sharing. oooo we’re having a cookout this weekend and I would love to try these out! following your site now! These look perfect I have got to get over the intimidation factor with breads and just start making some.